THIS ITEM IS NOT AVAILABLE AT PRESENT. WE WILL NOT BE GETTING ANYMORE Star Wars Rogue One U-Wing Fighter and TIE Striker 1/144th Scale Model Kits. From the Star Wars Rogue One collection by Bandai Hobby Gunpla. Star Wars Rogue One U-Wing Fighter and TIE Striker 1/144th Scale Model Kits. Set includes display stands for the two fighters - laser effect and canopy parts for the U-Wing - 2 pilots(unpainted) - 2 combat assault tanks - 2 combat assault tank drivers. This Model does not require glue. Ages 15 and up. 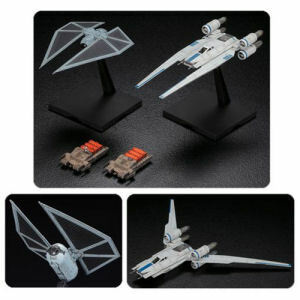 Bandai Hobby Gunpla Star Wars Models shipping from Canada. No Surprise Border fees or Customs!